InterLegis, an innovator of electronic discovery technologies, offers free eDiscovery processing and culling software via a downloadable link. InterLegis, an innovator of electronic discovery technologies, offers free eDiscovery processing and culling software via a downloadable link. 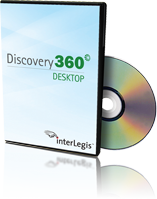 Discovery360 Desktop™ is InterLegis' end-to-end solution that allows corporations and law firms to perform eDiscovery processing, culling and/or review without the need to work with outside vendors. The software, customized installation, data processing, and culling are all free. Discovery360 Desktop is available immediately and free to install. To apply for a copy of the downloadable software, contact info(at)interlegis(dot)com or visit http://www.interlegis.com. InterLegis provides end-to-end eDiscovery technologies and services through its flagship product, Discovery360, which can be utilized as hosted service or installed on a local network. The technology ingests collected data and guides legal teams through the discovery life cycle, which includes data processing, early case assessment, culling, review and production. InterLegis offers an extremely cost-effective pricing model, which includes complimentary data processing, early case assessment, culling, productions, project management and support. For more information, visit http://www.interlegis.com.